Has anyone ever told you something true that you wished you did not know? It is a common problem. A wife hears the truth that her husband prefers another woman. A father hears that his son has been killed in an auto accident. A young girl discovers that her best friend has begun dating the boy she dreams of. A mother is told that her baby was stillborn. Most of us try to live by the principle of telling the truth, but we don’t always like the truth. Some people avoid the truth by pretending it is not so. Some enforce their willful ignorance of the truth by abusing other people who refuse to play along. The prophet Amos and John the Baptist both faced that problem. They spoke the truth as God instructed them to do. People who preferred lies forcefully rejected them. Amos, a Judean, showed up in Israel and began to preach that God was mad at neighboring countries. The Israelites were glad to hear that God was angry with their enemies. That truth sounded good, and they were eager to hear more of the same. However, when Amos announced that God thought Israel was out of line, not true when measured by a plumb line, the people of the northern kingdom took offense. They told him to go prophesy in Judah, and never to come back to Israel, because they did not like the kind of truth Amos told. Amos accused them of selfishness and greed and addiction to personal pleasure. He said God thought their sacrifices, offerings and worship activities were completely dishonest shams. He accused them of not actually worshiping God, no matter how good things looked. Amos was made persona non grata in Israel, because he was a loudmouth troublemaker. John the Baptist offended a lot of people, too. He called the religious leaders vipers and he accused the king of adultery. Unlike Amos who was simply run out of town, John was actually arrested. Ultimately he was beheaded, because he, too, was a loudmouth troublemaker. When standing for truth might cost someone power or celebrity status, many people reject the truth and pretend it isn’t so. 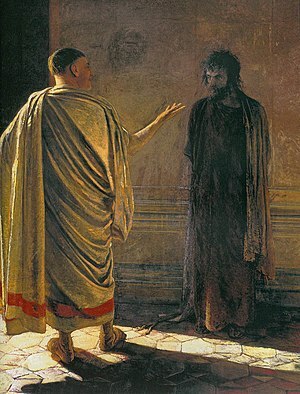 When Jesus was on trial before Pontius Pilate, Jesus said, “Everyone who belongs to the truth listens to my voice,” to which Pilate responded, “What is truth?” Pilate knew that Jesus was speaking truth, and Pilate knew that the religious leaders and their mob were speaking lies, but Pilate did not want to deal with the truth. His job was to keep riots down. In his worldview, Jesus, the itinerant rabbi that had the whole world in an uproar, was nothing but another loudmouth troublemaker. Jesus was executed, because Pilate could not accept truth. As Christians we, too, are called to be troublemakers. We are to be little Christs, sprinkled around in the culture like salt sprinkled on a stew. We are supposed to be busy telling the truth all the time. The truth about God. The truth about Christ. The truth about our life in relationship with Christ. We are to reject lies and live truth, and if we do that some people will hate us. If we say that an unborn baby is a living human being, we might be hated, even though we speak truth. If we say that a human embryo is a living human being, we might be even more hated, even though we speak truth. If we say that God does not create people with a genetic identity that runs counter to God’s own model for family structures, then we will be hated, even though we speak truth. If we say that we cannot show kindness to anyone without doing it in the name of Christ, and that therefore, we cannot ever perform completely secular service, we will be scorned, if not hated, and we may suffer some social and legal consequences. Nevertheless, we are called to be troublemakers. Loving, peaceful, kind, truthful little Christlike troublemakers. We must expect the consequences the culture visits on troublemakers.